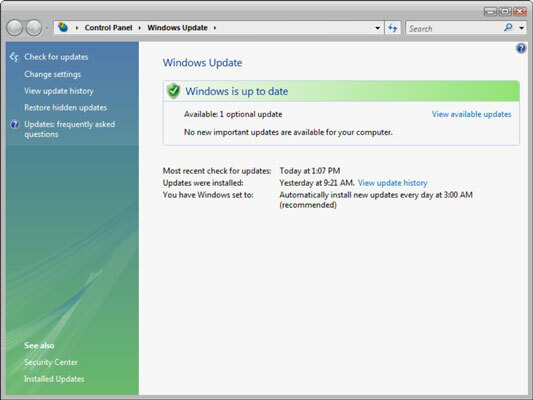 Knowing how to update a driver in Windows Vista is crucial to keeping your system performing at its best. Hardware manufacturers update the drivers (the little programs that enable Windows Vista to control the hardware) on a regular basis to deal with updates in Windows Vista itself and to improve their performance. If you don’t keep your drivers up-to-date, you could run into problems that make your hardware malfunction. In the resulting Help and Support window, click Table of Contents, then click Hardware, Devices, and Drivers, and finally click Driver Software. In the Driver Software window, click Repair or Update a Driver. In the resulting Repair or Update a Driver window, click the To Update Driver Software Using Windows Update link, click the Click to Open Windows Update link, and follow the instructions. The Windows Update window opens. Click the Check for Updates link in the left pane. 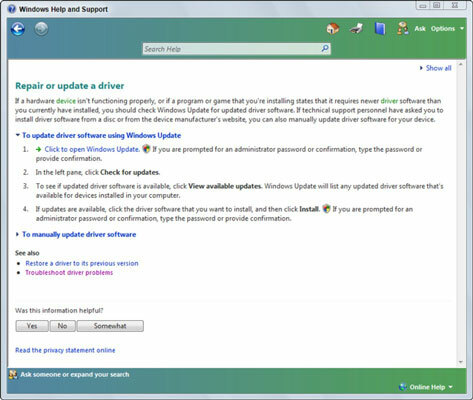 Windows Vista will search the Internet for updates to the drivers that are currently installed on your computer. When it’s finished checking, the right pane will indicate whether any updates are available. Click the View available updates link. You will see a list of updates that were found, sorted by type. Look to see if there are any updates for the driver you are looking for. If you find the driver you want, select the update and click the Install button. If you don’t find the updated driver using the Windows Vista procedure outlined above, consider going directly to the hardware manufacturer’s Web site and downloading the latest driver. When you finish updating the driver, click the Close button to close the Windows Help and Support window. In some cases, you have to reboot your computer to give Windows a chance to load the new driver. Choose Start→Turn Off Computer. In the resulting Turn Off Computer dialog box, click the Restart button to reboot your system. The driver should now, by the magic of the Windows Plug and Play feature that automatically detects new hardware, be working.